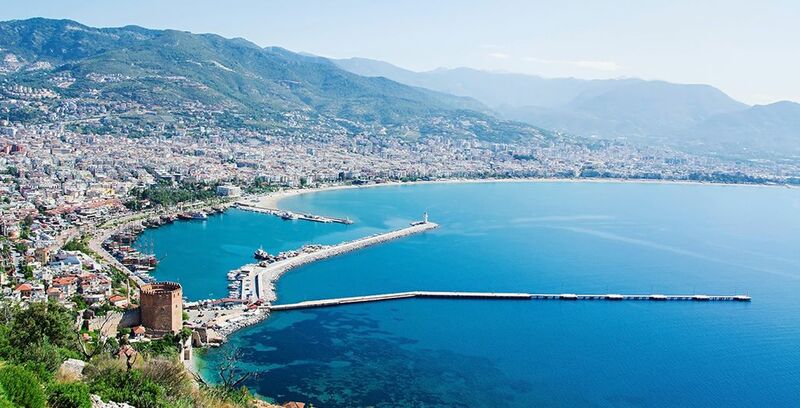 Holidays to Antalya up to -70% off To take advantage of these offers, join now for free! Antalya is a city suspended between East and West, a perfect union between the ancient world and fresh, exciting modernity. Here you can see stunning mosques, clean, mediterranean beaches, and ancient ruins. 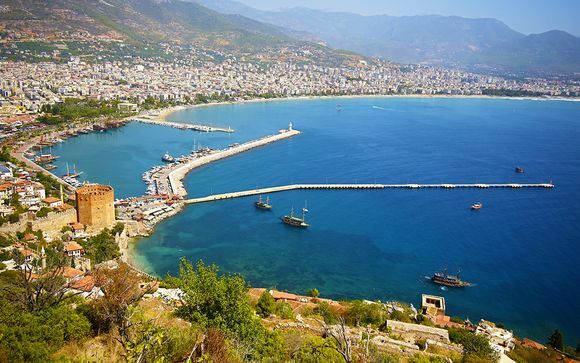 A true jewel of the Turkish coast, it's a place full of magic and history. Explore our handpicked offers for the best of this incredible city! 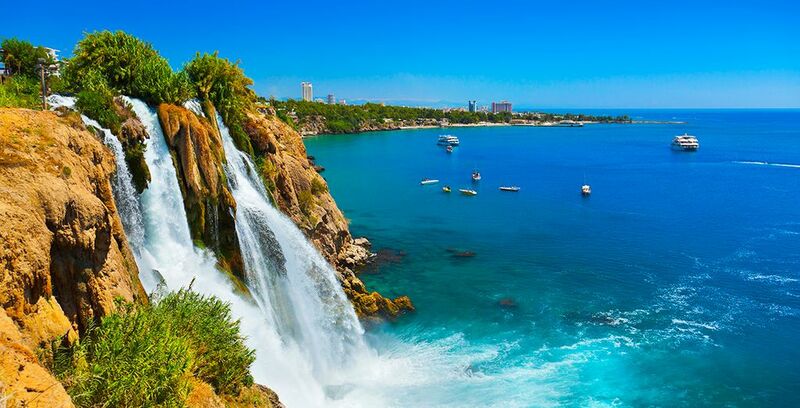 Antalya, a city rich in history, culture and stunning natural sights. 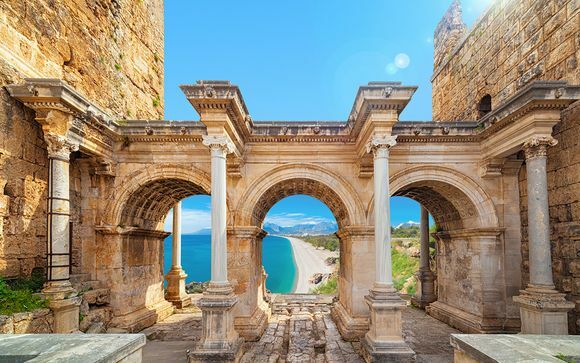 Bordered by the Taurus Mountains, Antalya is the largest Turkish city on the Mediterranean coast, flaunting pristine white sand beaches and ancient Roman and Byzantine ruins. During the crusades, christian warriors chose it as the perfect harbour on their way to Jerusalem. In 1923, it became an Ottoman city. Today, it is markedly Turkish, but it carries the complexity and beauty of the many cultures which inhabited it. Antalya is home to coastlines of incredible beauty, perfect for catching some rays and letting all your troubles wash away. 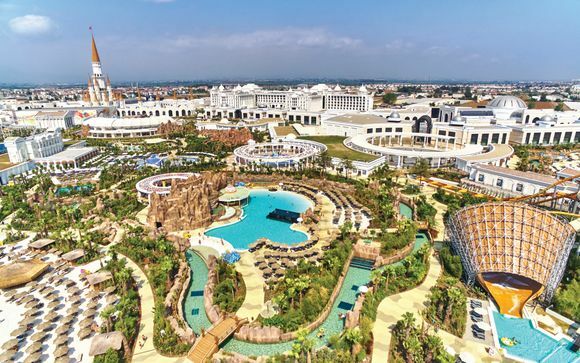 So whether you’re a history buff, a sun seeker or just looking for somewhere fun to take the kids, Antalya certainly has something for everybody. With the most incredible insta-worthy landscapes, it is well worth a day trip to these beautiful waterfalls. Make sure to visit both the Upper and Lower waterfalls and shoot some attractive photos to share with friends and family. If history and architecture are your thing, then you have to visit the Old Town of Kaleiçi, which houses many of Antalya’s hidden ruins and makes for a lovely relaxed afternoon in the city. With the Antalya Archaeological Museum, the ancient clock tower and the Yivliminare Mosque, there’s plenty in the way of culture in Kaleiçi. Surrounded by bustling local businesses, cafes and markets, there’s always something to keep the whole family entertained. While you’re in Old Town, make sure you take a stroll down to Hadrian’s Gate, one of the cities most beloved monuments, dating all the way back to the 2nd Century. Hadrian's Gate is a wonderfully preserved piece of architecture and history, which is the only remaining entrance gate in the walls that surround the city and harbour. For a romantic evening out, take advantage of the local Mediterranean cuisine and nightlife in Old Town, making sure to explore the modern side of this great city. Walking by the beach in the evenings you will find places to have a drink by the sunset and have a dance with the locals. An unmissable delight is the many panoramic terraces which look over the old harbour. Once the most prosperous city of the ancient world, now a vast rubble-filled stadium surrounded by half-desecrated temples. Make the most of the ruins at Perge, as unlike most restoration sites, the ruins of Perge allow you to get up close and experience everything for yourself. A perfect spot for lunch with the locals, overlooking Antalya’s beautiful coastline. Great if you love being touristy and are interested in seeing what excursions are on offer. If the hustle and bustle is not your scene, there are nice restaurants from the cliff top with an unbeatable view. Take a tour of the Sunken city of Kekova, enjoy a spot of lunch and swim in the hidden coves. With intimate boat tours, stunning sunsets and dinner with a view, Antalya is the perfect romantic getaway for couples looking for somewhere to soak in the culture, as well as each other’s company. Sign up for a tour of the sunken city of Kekova (an ancient Lycian city now buried beneath the sea) and spend the afternoon soaking up some sun and history. Get settled in one of our wide selection of hand-picked, luxury hotels, and start making your way among the ancient sights of this stunning city! Located on the famous Falez Hills, only a 5 minutes drive from Antalya centre, the Marmara Antalya 5* allows you to wake up every morning with a great view on an impressive private beach. 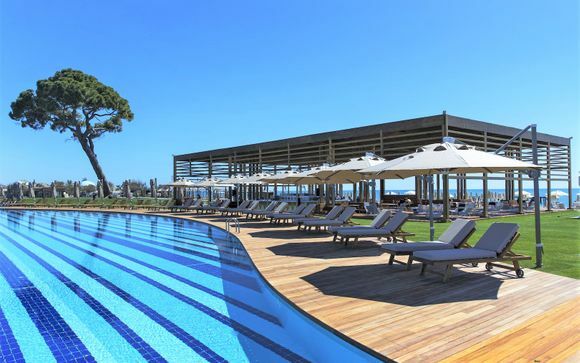 This beach front hotel offers a wellness holidays with its spa, gymp and outdoor pool. 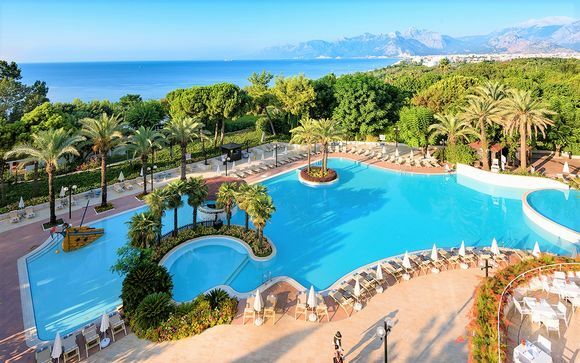 Escape to Antalya, to the charming Rixos Beldibi Hotel. With a 5* spa experience, multiple fine dining restaurants and exquisite sea views, you’ll never want to leave. 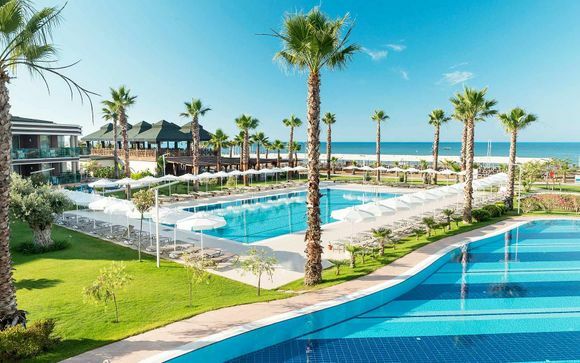 All-inclusive 5* hotel with a stunning array of restaurants, bars and cafes, as well as spa facilities, a gym, tennis courts and even a bowling alley. This hotel has everything from an aqua park to massages and hydrotherapy. Everything you could ask for, for a fun and relaxing holiday. With hot summers, mild winters and plenty of things to do in both, Antalya is an exceptional place to visit all year round. Temperatures in the height of summer can rise to 35°, so remember to pack that sun cream. Whether you’re looking for modest accommodation in the heart of the Old town, or a luxury 5* hotel overlooking the coast, travelling to Antalya doesn’t have to break the bank, if you’re working on a budget. Most visitors arrive between May and September, but even in the height of summer Antalya’s prices remain pleasantly affordable. Make sure to book early for the best prices though! Discover more offers to Turkey : Great deals, holidays, Last minute, Weekends, Sun holidays.